Device will be like new in condition. It will be free of any blemishes, scratches, cracks, chips or dents. Device will be in very good condition. It may have 1-2 hairline scratches but may not be visible unless held under light. It will be free of any cracks, chips or dents. Device will be in fairly good condition. It may have moderate signs of usage including scratches, sun spots and/or slight discoloration. B stock also may have a tiny nick on housing while rest of phone is flawless. It will be free of any cracks, chips or dents. Device will be in below average condition. It may have heavy signs of usage including heavy amounts of scratches, sun spots and/or discoloration. C stock may also have dents and chips on housing. It will be free of any cracks in housing or on glass. 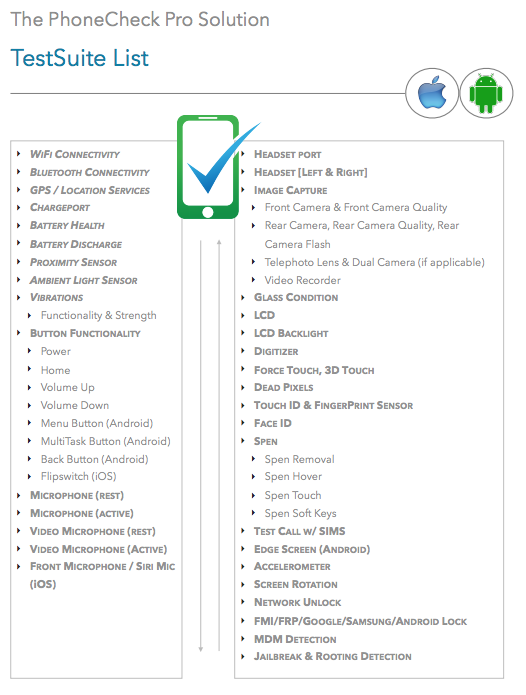 PhoneCheck Pro mobile diagnostic software using optimal hardware.